When it comes to municipal finances, we may have entered the calm before the storm. You can go to the MuniNet Guide, which describes itself as the “hub for state, local and municipal research,” and find detailed historical statistics on the bankruptcies of small municipal utilities and special purpose districts, cities, towns, villages and counties. What can we learn? First of all, that such filings are relatively rare. 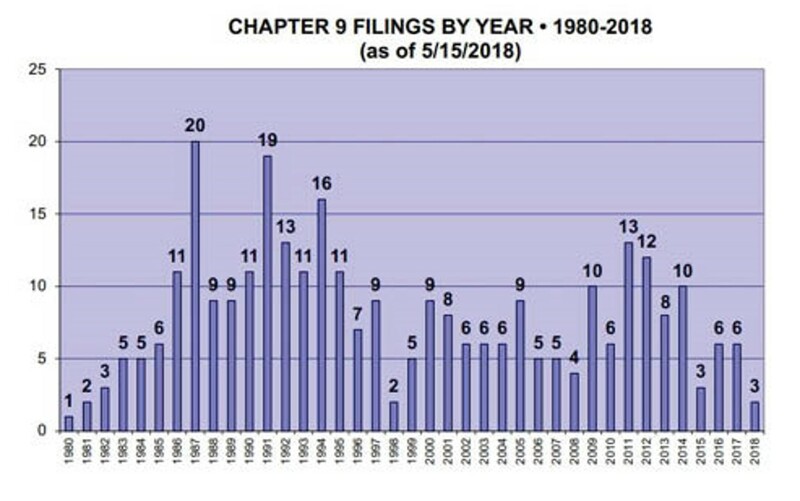 Since 1937, there have been just 680 so-called Chapter 9 municipal bankruptcy filings, including 311 since 1980 and only 64 since 1954. The default rate on workers’ pension plans and bond obligations has dropped in recent years; there have been just 3 so far in 2018, 6 last year, 6 in 2016 and 3 in 2015. The report notes some of the most famous defaults, including Detroit, MI ($18.5 billion in 2013), San Bernardino, CA ($492 million in 2012) and, of course, Orange County, CA ($1.97 billion in 1994). Since 1980, Nebraska leads all states with 65 local Chapter 9 filings, followed by California (49) and Texas (40). That’s the calm, but where’s the storm? A deeper analysis, provided by researchers at Harvard, shows that U.S. states, which are not permitted to go bankrupt, have developed an alarming tendency to over-promise pension returns to their workers, and may have to put their hands in their residents’ pockets in order to make good on their debt and pension obligations. 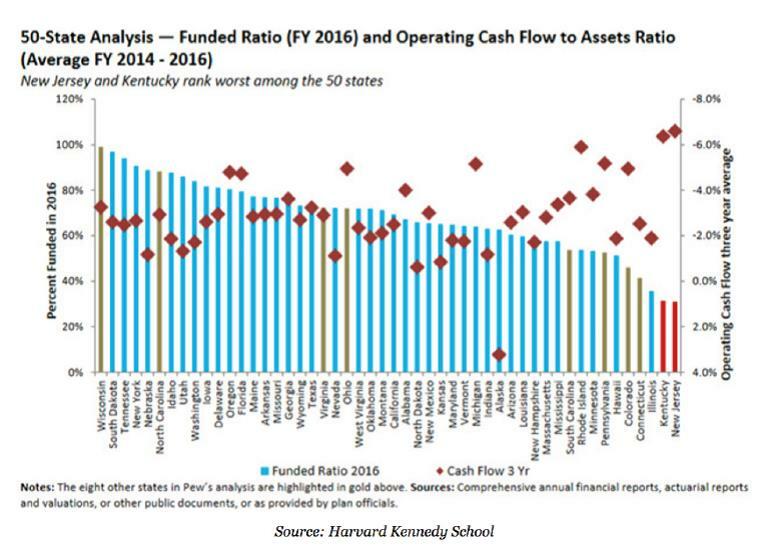 As you can see from the chart, the so-called “funded ratio”—basically the amount of money on hand compared with the overall obligations—ranges from pretty good (Wisconsin, South Dakota, Tennessee and New York) to pretty awful, as in: the 30s (New Jersey, Kentucky and Illinois). Many municipalities and local governments, which compete with their states for bureaucratic workers, are even deeper in the red, and are still projecting high rates of return on their escrow accounts, beyond what any reasonable advisor would expect. 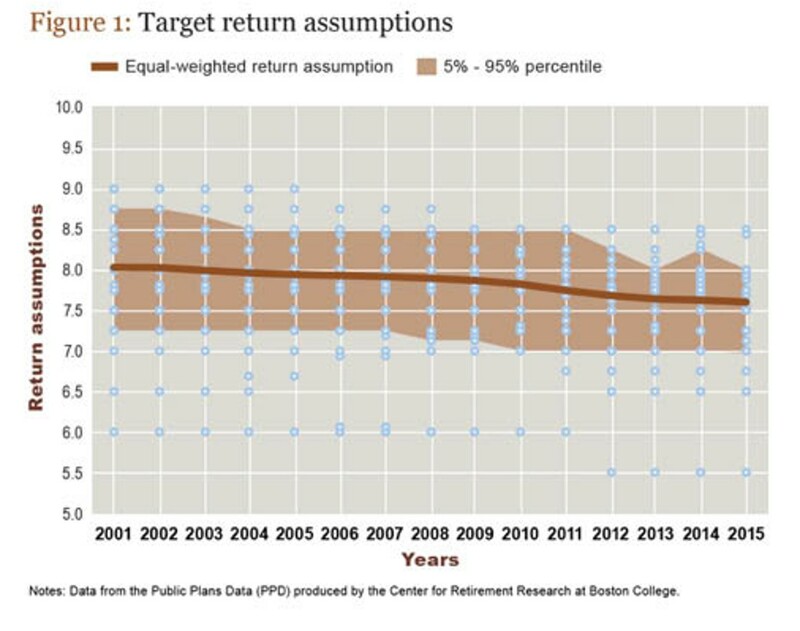 According to a report by the Center for Retirement Research at Boston College, state and local public pension plans are still assuming that their pension reserve portfolios will earn, on average, 7.5% a year, down a little bit from 8% in 2001. As you can see from the chart, some are projecting 8.5% yearly returns—at a time when most financial planners would caution that you would be lucky to average more than 5% going forward the next ten years. Underfunded pensions that are projecting that the markets will deliver more than they probably will is a recipe for disaster. A state and local municipal default storm is surely on the horizon, which means there could be a storm of Chapter 9 defaults making headlines over the next couple of years.